A shallow, magnitude-6.4 temblor shook Sumatra today, killing at least 70 people. Image is courtesy of U.S. Geological Survey. At 10:49 a.m. local time today, a deadly magnitude-6.4 earthquake shook Indonesia, according to the U.S. Geological Survey (USGS). The temblor killed at least 70 and sent residents in search of higher ground in fear of a tsunami, according to an Associated Press (AP) story. USGS says the earthquake was centered 60 kilometers northeast of Padang, located on the island of Sumatra, and 930 kilometers northwest of Jakarta, which is Indonesia's capital and located on the island of Java. 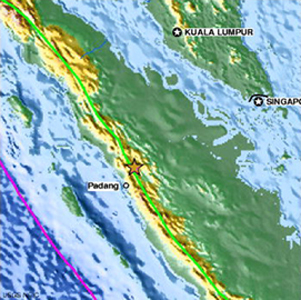 The shallow event, which USGS says originated at a depth of only 30 kilometers, could be felt in neighboring countries Malaysia and Singapore, according to AP. Today's earthquake was of the type that is "typical in that area," says John Bellini, a geophysicist with USGS, occurring inland on a strike-slip fault. Previous notable earthquakes to shake the region include a magnitude-7.7 event July 17, 2006, south of Java that killed 730 and a magnitude-6.3 earthquake May 26, 2006, in Java that killed 5,749. Sumatra was also the site of the Dec. 26, 2004, magnitude-9.1 earthquake and ensuing tsunami that killed 283,106, according to USGS. No tsunami was reported to strike Sumatra as a result of today's temblor, according to AP.